It’s great to give your prospects and customers plenty of options…. or is it? Are you guilty of giving your prospects and customers too many choices? Here’s one of the many great examples that Barry Schwartz discusses in his book Paradox of Choice. A group of shoppers was given the chance to sample an assortment of premium jams. Half the group was offered a selection of 6 (six) samples, and the other half was offered a selection of 24 (twenty-four) samples. A full 30% of the shoppers who were offered ONLY six samples ended up purchasing some of the jam. However, only 3% of the group offered twenty-four samples made a purchase. That’s 90% fewer sales. Too many choices leads to confusion, a longer purchasing process, and fewer sales. But why is this true? Too many choices requires too much thinking. When too much thought is required to make a decision… we often choose to do nothing. Even when we know that a decision WILL BE required, we will often delay the decision until we can collect more information to help us justify the decision. No one likes to make THE WRONG DECISION. And this is why we by default look for certain information prior to making a difficult decision. We don’t want to blame ourselves for making the wrong decision. Here are 4 steps to help your prospects and customers make favorable purchasing decisions more quickly. 1. Limit the number of choices. 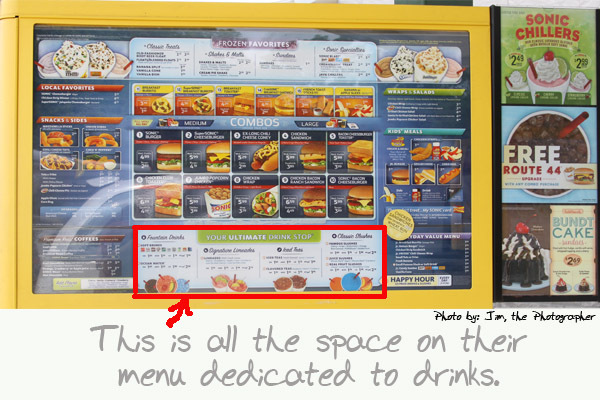 How many possible drink combinations are available at Sonic Drive-In? 688,133 ! Ridiculous, right? But how many are actually on their menu? You can see it’s certainly far less than 688,133. Actually, far less than 50 are mentioned on the menu. 2. Organize purchasing decisions into categories. Think about purchasing a new vehicle. How much more frustrating and confusing would the process be if car lots mixed both new and used vehicles? And what if they didn’t put all the trucks in one section, all the cars in another, and all the SUVs in another? Imagine how frustrating the process would be. 3. Give them guidelines for making decisions. If your order process contains multiple steps, or has more than a dozen (or so) options, be sure to give your prospects and customers guidelines to help them make the decision quicker. Let them know what will happen during the purchase process, and exactly what step they should take next. Despite the confusing menu in the photo above, it’s made clear exactly where to go when you’re ready to place your order. 4. Let them know they’re not alone. Because no one wants to make the wrong decision, we often look to see if others have previously made the decision we are about to make. We are looking for social proof that the decision is okay. The use of testimonials can go a long way toward relieving the innate fear of making the wrong decision. Amazon does a great job of this through their customer reviews on the products they sell. 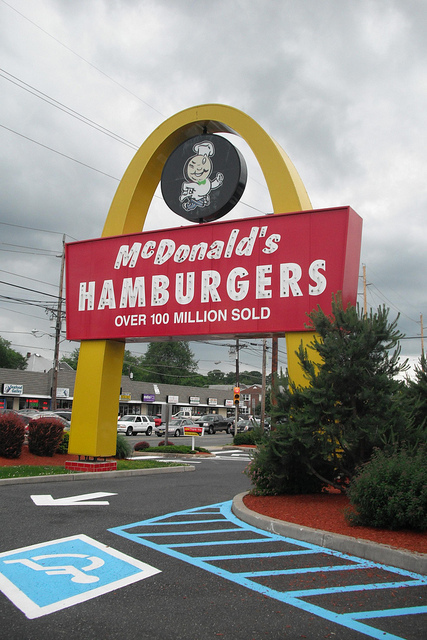 McDonald’s uses a subtle testimonial on their signs…can you spot it?